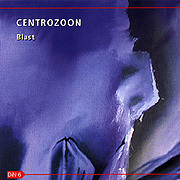 The duo of centrozoon produce spacemusic difficult to quantify, trace or categorize; their distinguishing characteristic being improvisation. The debut CD Blast is brought to us through this popular method of self-expression. On this work Bernhard Wostheinrich realizes equally original and complicated synth tones that churn like an ocean underneath the cloud motion of Markus Reuter's treated Warr Guitar. Blast speaks to the listener with a musical vocabulary of contrasting harmonies and remarkable timbres. When a melody does surface, it is slow and deliberate, like a new character briefly entering a dream. Not entirely without rhythm, Blast occasionally presents us with some unusual patterns or loops - obviously created through centrozoon's own creative devices. On Blast the duo have an album that is at once experimental, cerebral, spacious and engaging. Blast creates its own space, colored by the listener's imagination.